Bring the festive spirit to your kitchen with this pair of Christmas Reindeer Tea Towels. These gift wrapped 100% cotton tea towels are in a classic seasonal red featuring a print of Christmas stars and reindeer. Matching accessories too! 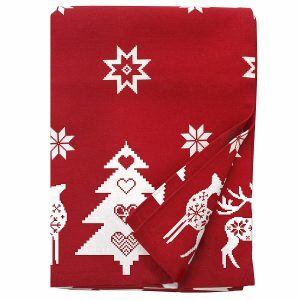 Keep the festive spirit going with these gorgeous Red Festive Reindeer Tea Towels in our new design. Already gift wrapped, they would make a perfect gift for someone you love too! 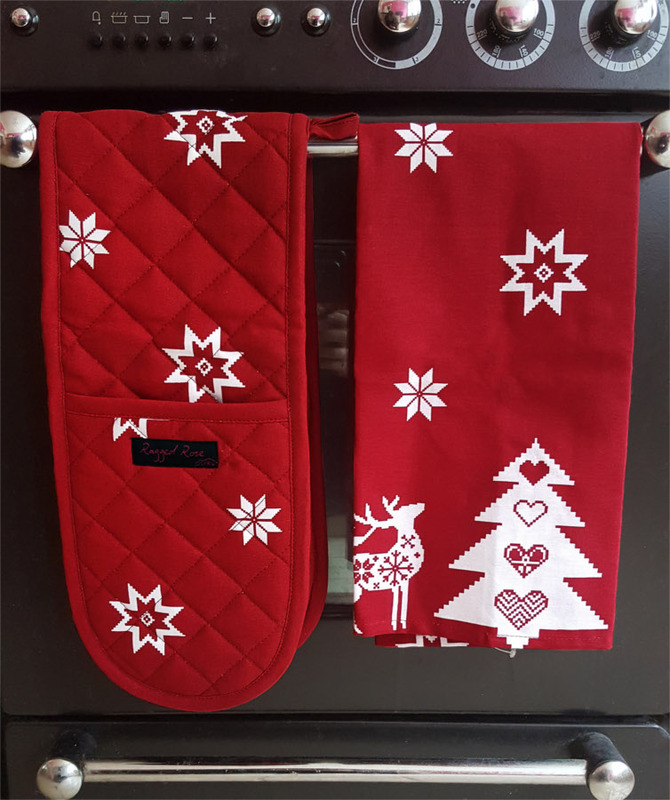 Made from 100% cotton, these gorgeous kitchen tea towels have a seasonal red background. The print features a scattering of white Christmas stars. The stars are large and small in size. 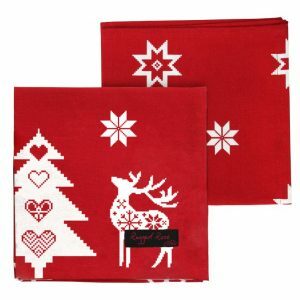 The edge of the red Christmas tea towel features reindeer beside beautifully heart decorated white Christmas trees. 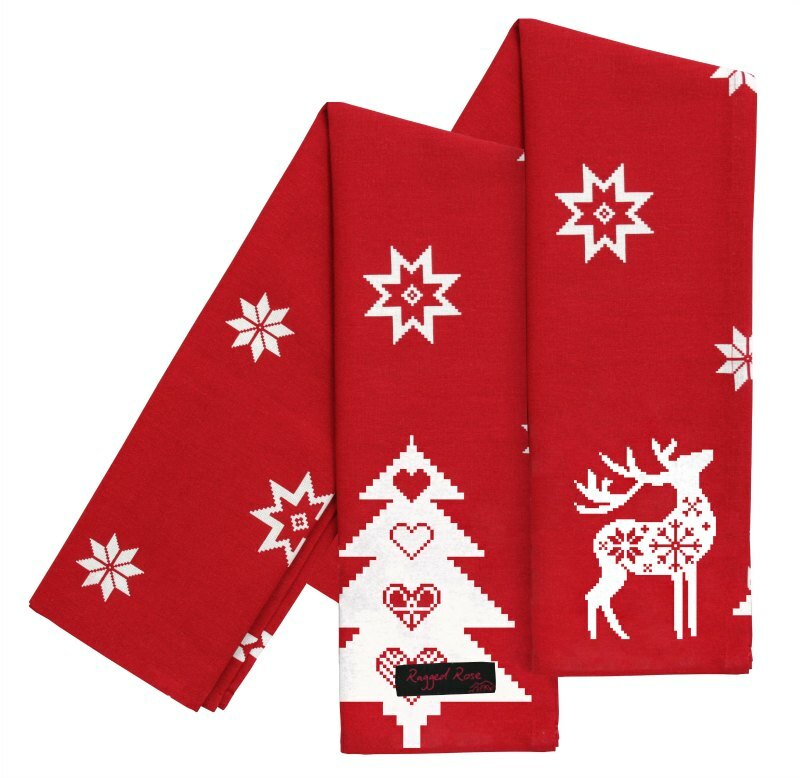 There’s a handy hanging loop on each of your Red Festive Reindeer Tea Towels that makes it easy to store away when not in use. These cotton tea towels are also machine washable at 40 degrees but we suggest a slow spin to avoid heavy creasing. When washing your red Christmas tea towels, to keep the colour pristine, you should use a non bio detergent. It’s wise to wash these red tea towels with items of a similar colour. If they get a little creased, simply iron them out on the reverse. 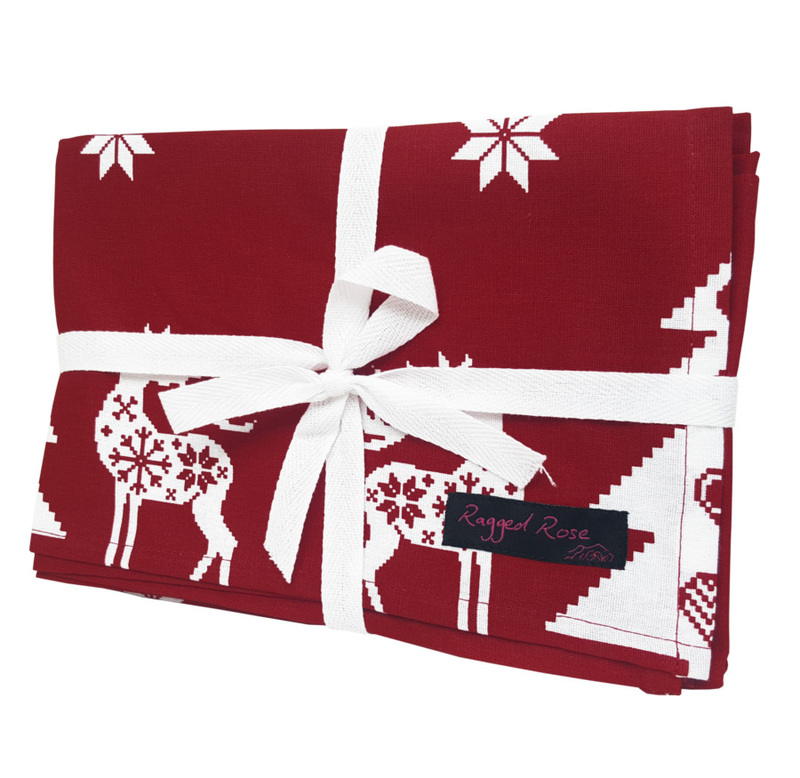 Our pretty folkloric Red Festive Reindeer Tea Towels are gift wrapped with a natural off white ribbon. So they would make a great stocking filler! There’s a variety of matching items available too. 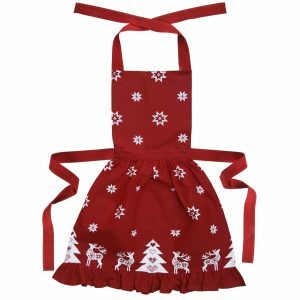 Everyone can get involved with the Christmas preparations by wearing the festive Betty Christmas Apron or the Billy Christmas Apron. It’ll turn Christmas into a real family affair in the kitchen. Spread the festive season throughout your home with the help of our Christmas Shop. 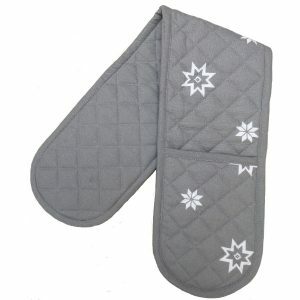 Protect your hands with one of our red Christmas Oven Gloves. Decorate your table with our seasonal red Tablecloth and Napkins. When the feast is over, you can keep your Christmas Table decorated with our festive Table Runner. If you fancy something a little different, we have Christmas aprons, tea towels, table linen and oven gloves available in silver/grey and white with the same seasonal print. Christmas will soon be upon us so if you see something you like, place your order in time for the item to arrive before Christmas Day!